iCliniq › Ask a doctor online › Health Articles › Heart Health › How Much Fiber Should You Eat Everyday? 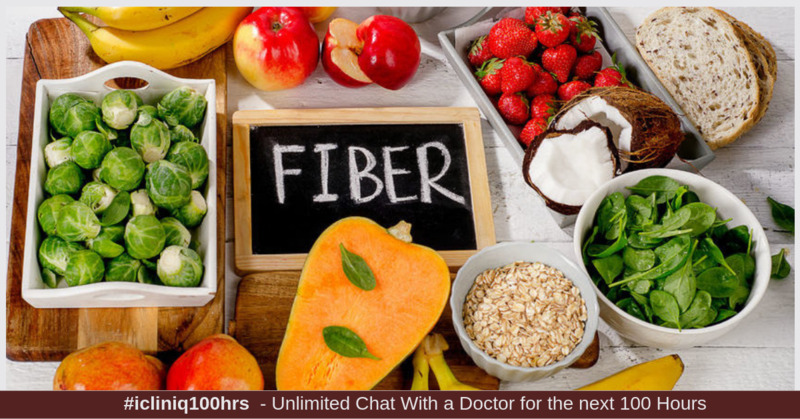 Following are some of the reasons why fiber plays a very important role in our health. Have you ever wondered why you are not losing weight despite exercising a lot? Well, lack of fiber in your diet is the answer. Fiber plays a very important role when it comes to losing weight. To our advantage, fibers are available in the natural form and there is no need to consume any kind of supplement for it. Fiber is available in a variety of fruits and vegetables. Have a good variety of fruits as often as possible, especially seasonal fruits. You can sprinkle sunflower seeds on the fruits as it is a very good source of calcium. Soluble fiber acts as a best friend to your heart as it keeps you away from harmful cholesterol, thus regulating your blood pressure. Soluble fiber aids to clear off the extra cholesterol deposited in your arteries and prevent heart diseases like ischemic heart disease, coronary heart disease, myocardial infarction, and stroke. Apple and oats are a good source of soluble fiber. You can make a sugarless smoothie out of it and consume it by adding dates instead which is a very great source of iron and you definitely will not feel lethargic. Do not forget to add some amount of flaxseeds too which are a good source of omega-3 fatty acids and is anti-inflammatory in nature. Ever wondered why constipation occurs? Well, Lack of fiber along with lack of fluids causes it. Constipation can be prevented by having a variety of fruits and vegetables. Do consume brown rice instead of white rice. It has more amount of fiber than white rice and it is more nutritious as it contains B complex vitamins which will give you ample amount of energy. As it is low in the glycemic index, even diabetics can consume brown rice instead of white rice. Always remember to control your portion size so that you do not overeat anything and store on a lot of fat. Instead of polished rice, do try consuming the traditional whole wheat items along with a balanced diet. It contains fiber and is especially beneficial for diabetics as it will not raise your blood sugar level faster. Exercise daily as it will also help prevent constipation. Go hit your gym, run daily and practice a variety of aerobic and anaerobic exercises daily. Too much of anything is toxic. If you consume too much fiber daily, more than the recommended intake for women that is 25 grams per day and for men that is 38 grams per day, you might start experiencing abnormal bowel symptoms like diarrhea. Your body will not absorb the nutrients actually needed for you if over consumed. It might hinder the absorption of various nutrients like calcium, iron, magnesium, selenium, and iodine which are very much essential for our body. Therefore, always remember not to over consume a particular nutrient. Hope you enjoyed reading the article and will keep these points in mind. Do you have a question on Heart Health or High Fibre Diet?